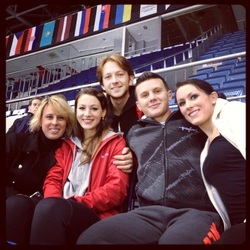 So today was our first day of competition in Bratislava. The day startet early like often happens. We had practice for Short Dance at 8 in the morning. The icerink where the competition is, is really nice. A lot of space for public and the ice is good too. We were fit and fresh at the practice and so it was pretty good. After we were going to eat breakfast and relax a little bit, because at 14.00 pm we had already the Short Dance competition. We were in the first group and had the starting number 3. The competition was going really well for us. We were confident and i had a lot of fun skating the Short Dance, more than i expected. The points were pretty high (we reached 57,82 points) which means the third place.We are really happy about that result and surprised indeed that we are in front of the other german couple Nelli Zhiganshina/Alexander Gaszi. First Place did the english couple Penny Coomes/Nicholas Buckland and second our teammades Charlene Guignard and Marco Fabbri and we are also really happy for them. In the draw after the Short Dance Stefano was taking the number 14, so we will start as the last couple. Now we will relax and eat something and maybe watch the woman skating their free dance. So, we will write tomorrow again. Official Website © Tanja Kolbe & Stefano Caruso - All Rights Reserved.